Local 4-Hers experience a dragon boat on the Cuyahoga River in Cleveland. During the week of June 15, Champaign County 4-H and Cuyahoga County 4-H participated in the first Growing Youth to Youth Sharing Communities program. June 15-17 Cuyahoga County brought 4-Hers down to learn more about life in and around Champaign County. This included stops at the Ohio Caverns, Marie’s Candies. Freshwater Fish Farms, and Young’s Dairy. The following day the Cuyahoga County kids visited the Champaign County Fairgrounds where the Jones Family shared their alpacas, goats and rabbits. The Champaign County Horse advisors helped so the students could learn about horses, equipment, how to groom, and best of all, ride. The group then loaded the bus to the Terry Dillon’s Farm where they got the chance to hold two week old bunnies. During the visit to D&D Hollingsworth Goat Farm, 4-Her Lane Hollingsworth did an outstanding job talking about his projects and the group was given the opportunity to clip goats. At Andy Maurice’s dairy farm got a neat surprise, to see a 2 hour-old calf. Andy gave a great tour while the cows were being milked, then the group went to the nursing building where everyone had the opportunity to bottle feed the calves. The evening ended at the fairgrounds with games, dinner and fun. The Lusk Family llamas were a hit with musical squares and races. June 17 a group of Champaign County 4-Hers traveled up to Cleveland to see what life is like in Cuyahoga County. This included a stay at the Cleveland Hostel and a trip to Mitchell’s Ice Cream. The next day, the group had the opportunity to visit the Cleveland Art Museum and see the University Circle area. The group then visited the Cleveland Lakefront Metro Parks Nature Reserve to hike along a path to Lake Erie, and built their own kites. That afternoon they visited the Czechoslovakian cultural center and were given the opportunity to participate in Sokol classes, a form of gymnastics, and were given a taste of Czechoslovakian cooking. That evening concluded trip to Progressive Field to see the Indians play. The next day gave the students the opportunity to see some examples of alternative energy when they visited a wind turbine at the Cuyahoga County Fairgrounds. The trip concluded with a visit to the Cuyahoga County Extension office for Upcycling, which takes odds and ends of other objects and makes them into art. Overall, the participants had a fantastic time making new friends and exploring new communities. They were thankful to the residents of both Champaign and Cuyahoga County for being so welcoming while they were visiting and hope to continue the program for many years to come. 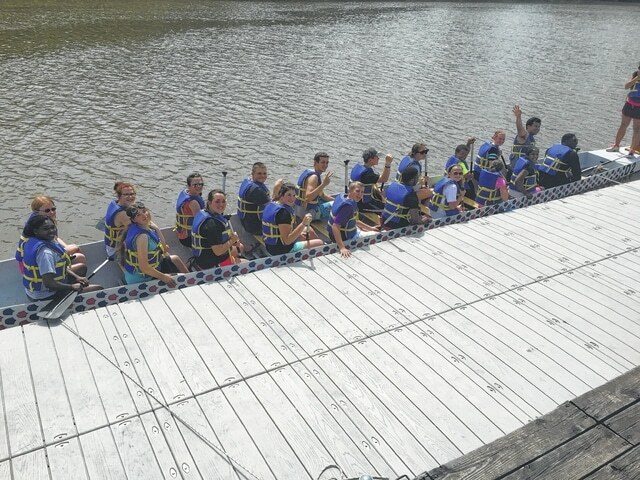 https://www.urbanacitizen.com/wp-content/uploads/sites/36/2015/07/web1_IMG_5014_2.jpgLocal 4-Hers experience a dragon boat on the Cuyahoga River in Cleveland.